The NewEar hearing amplifier is lightweight and small in size. It can be used in either ear. For convenience, the device comes with three earplugs of different sizes. It's perfect for individuals of all ages. You can profoundly rely on this unit as it consumes little power and has a rugged construction that is strong enough to last for a lifetime. "NEW" RECHARGEABLE FEATURE: Our device is simple and user-friendly. It runs with high quality rechargeable battery, literally lowering the lifetime expenses on battery in the long run. Its great battery offers around 40 hours continuously using after fully charged. 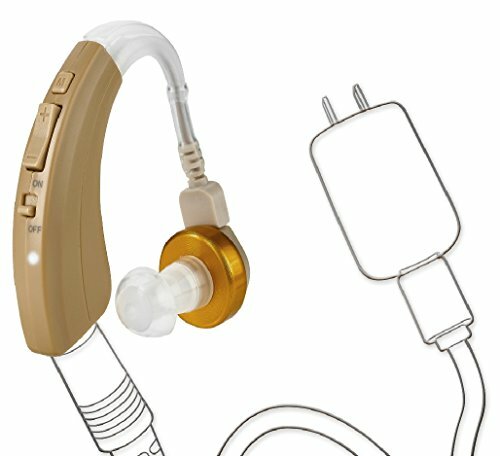 SUPERIOR DESIGN: Our hearing amplifier is designed by an audiologist. It has been innovated keeping in mind the hearing requirements and limits of an individual. The device has a sleek and stylish design, and comes with a very attractive golden receiver. DIGITAL HEARING AMPLIFIER: NewEar Digital amplifier is the best solution for people with hearing condition. The device has full digital circuitry and a digital volume control for convenience.